This article is about the characters used in Japanese writing. For other uses, see Kanji (disambiguation). Kanji (漢字; [kã̠ɴʑi] listen) are the adopted logographic Chinese characters that are used in the Japanese writing system. They are used alongside the Japanese syllabic scripts hiragana and katakana. The Japanese term kanji for the Chinese characters literally means "Han characters". It is written with the same characters in the Chinese language to refer to the character writing system, hanzi (漢字). For a list of words relating to kanji, see the Japanese-coined CJKV characters category of words in Wiktionary, the free dictionary. Nihon Shoki (720 AD), considered by historians and archaeologists as the most complete extant historical record of ancient Japan, was written entirely in kanji. Chinese characters first came to Japan on official seals, letters, swords, coins, mirrors, and other decorative items imported from China. The earliest known instance of such an import was the King of Na gold seal given by Emperor Guangwu of Han to a Yamato emissary in 57 AD. Chinese coins from the first century AD have been found in Yayoi period archaeological sites. However, the Japanese of that era probably had no comprehension of the script, and would remain illiterate until the fifth century AD. According to the Nihon Shoki and Kojiki, a semi-legendary scholar called Wani (王仁) was dispatched to Japan by the Kingdom of Baekje during the reign of Emperor Ōjin in the early fifth century, bringing with him knowledge of Confucianism and Chinese characters. The earliest Japanese documents were probably written by bilingual Chinese or Korean officials employed at the Yamato court. For example, the diplomatic correspondence from King Bu of Wa to Emperor Shun of Liu Song in 478 has been praised for its skillful use of allusion. Later, groups of people called fuhito were organized under the monarch to read and write Classical Chinese. During the reign of Empress Suiko (593–628), the Yamato court began sending full-scale diplomatic missions to China, which resulted in a large increase in Chinese literacy at the Japanese court. The Japanese language had no written form at the time Chinese characters were introduced, and texts were written and read only in Chinese. Later, during the Heian period (794–1185), however, a system known as kanbun emerged, which involved using Chinese text with diacritical marks to allow Japanese speakers to restructure and read Chinese sentences, by changing word order and adding particles and verb endings, in accordance with the rules of Japanese grammar. Chinese characters also came to be used to write Japanese words, resulting in the modern kana syllabaries. Around 650 AD, a writing system called man'yōgana (used in the ancient poetry anthology Man'yōshū) evolved that used a number of Chinese characters for their sound, rather than for their meaning. Man'yōgana written in cursive style evolved into hiragana, or onna-de, that is, "ladies' hand," a writing system that was accessible to women (who were denied higher education). 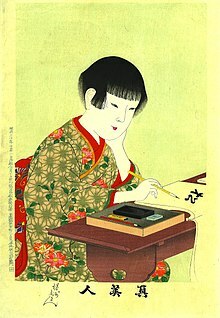 Major works of Heian-era literature by women were written in hiragana. Katakana emerged via a parallel path: monastery students simplified man'yōgana to a single constituent element. Thus the two other writing systems, hiragana and katakana, referred to collectively as kana, are descended from kanji. In comparison to kana (仮名, "provisional character") kanji are also called mana (真名, "true name, true character"). In modern Japanese, kanji are used to write parts of the language (usually content words) such as nouns, adjective stems, and verb stems, while hiragana are used to write inflected verb and adjective endings and as phonetic complements to disambiguate readings (okurigana), particles, and miscellaneous words which have no kanji or whose kanji is considered obscure or too difficult to read or remember. Katakana are mostly used for representing onomatopoeia, non-Japanese loanwords (except those borrowed from ancient Chinese), the names of plants and animals (with exceptions), and for emphasis on certain words. In 1946, after World War II and under the Allied Occupation of Japan, the Japanese government, guided by the Supreme Commander of the Allied Powers, instituted a series of orthographic reforms, to help children learn and to simplify kanji use in literature and periodicals. The number of characters in circulation was reduced, and formal lists of characters to be learned during each grade of school were established. Some characters were given simplified glyphs, called shinjitai (新字体). Many variant forms of characters and obscure alternatives for common characters were officially discouraged. These are simply guidelines, so many characters outside these standards are still widely known and commonly used; these are known as hyōgaiji (表外字). The jōyō kanji (常用漢字, regular-use kanji) are 2,136 characters consisting of all the Kyōiku kanji, plus 1,130 additional kanji taught in junior high and high school. In publishing, characters outside this category are often given furigana. The jōyō kanji were introduced in 1981, replacing an older list of 1,850 characters known as the tōyō kanji (当用漢字, general-use kanji), introduced in 1946. Originally numbering 1,945 characters, the jōyō kanji list was extended to 2,136 in 2010. Some of the new characters were previously Jinmeiyō kanji; some are used to write prefecture names: 阪, 熊, 奈, 岡, 鹿, 梨, 阜, 埼, 茨, 栃 and 媛. Since September 27, 2004, the jinmeiyō kanji (人名用漢字, kanji for use in personal names) consist of 3,119 characters, containing the jōyō kanji plus an additional 983 kanji found in people's names. There were only 92 kanji in the original list published in 1952, but new additions have been made frequently. Sometimes the term jinmeiyō kanji refers to all 3,119, and sometimes it only refers to the 983 that are only used for names. Hyōgai kanji (表外漢字, "unlisted characters") are any kanji not contained in the jōyō kanji and jinmeiyō kanji lists. These are generally written using traditional characters, but extended shinjitai forms exist. JIS X 0208, the most recent version of the main standard. It has 6,355 kanji. JIS X 0221:1995, the Japanese version of the ISO 10646/Unicode standard. Gaiji (外字, literally "external characters") are kanji that are not represented in existing Japanese encoding systems. These include variant forms of common kanji that need to be represented alongside the more conventional glyph in reference works, and can include non-kanji symbols as well. Gaiji can be either user-defined characters or system-specific characters. Both are a problem for information interchange, as the code point used to represent an external character will not be consistent from one computer or operating system to another. Gaiji were nominally prohibited in JIS X 0208-1997, and JIS X 0213-2000 used the range of code-points previously allocated to gaiji, making them completely unusable. Nevertheless, they persist today with NTT DoCoMo's "i-mode" service, where they are used for emoji (pictorial characters). Unicode allows for optional encoding of gaiji in private use areas, while Adobe's SING (Smart INdependent Glyphlets) technology allows the creation of customized gaiji. There is no definitive count of kanji characters, just as there is none of Chinese characters generally. The Dai Kan-Wa Jiten, which is considered to be comprehensive in Japan, contains about 50,000 characters. The Zhonghua Zihai, published in 1994 in China contains about 85,000 characters; however, the majority of these are not in common use in any country, and many are obscure variants or archaic forms. Approximately 2,000 to 3,000 characters are commonly used in Japan, a few thousand more find occasional use, and a total of 13,108 characters can be encoded in various Japanese Industrial Standards for kanji. *With L1 representing the language borrowed from (Chinese) and L2 representing the borrowing language (Japanese). Because of the way they have been adopted into Japanese, a single kanji may be used to write one or more different words—or, in some cases, morphemes—and thus the same character may be pronounced in different ways. From the reader's point of view of, kanji are said to have one or more different "readings". Although more than one reading may become activated in the brain, deciding which reading is appropriate depends on recognizing which word it represents, which can usually be determined from context, intended meaning, whether the character occurs as part of a compound word or an independent word, and sometimes location within the sentence. For example, 今日 is usually read kyō, meaning "today", but in formal writing is instead read konnichi, meaning "nowadays"; this is understood from context. Nevertheless, some cases are ambiguous and require a furigana gloss, which are also used simply for difficult readings or to specify a non-standard reading. Kanji readings are categorized as either on'yomi (literally "sound reading", from Chinese) or kun'yomi (literally "meaning reading", native Japanese), and most characters have at least two readings, at least one of each. However, some characters have only a single reading, such as kiku (菊, "chrysanthemum", an on-reading) or iwashi (鰯, "sardine", a kun-reading); kun-only are common for Japanese-coined kanji (kokuji). Some common kanji have ten or more possible readings; the most complex common example is 生, which is read as sei, shō, nama, ki, o-u, i-kiru, i-kasu, i-keru, u-mu, u-mareru, ha-eru, and ha-yasu, totaling 8 basic readings (first 2 are on, rest are kun), or 12 if related verbs are counted as distinct; see okurigana: 生 for details. Most often, a character will be used for both sound and meaning, and it is simply a matter of choosing the correct reading based on which word it represents. In other cases, a character is used only for sound (ateji). In this case, pronunciation is still based on a standard reading, or used only for meaning (broadly a form of ateji, narrowly jukujikun). Therefore, only the full compound—not the individual character—has a reading. There are also special cases where the reading is completely different, often based on a historical or traditional reading. The analogous phenomenon occurs to a much lesser degree in Chinese varieties, where there are literary and colloquial readings of Chinese characters—borrowed readings and native readings. In Chinese these borrowed readings and native readings are etymologically related, since they are between Chinese varieties (which are related), not from Chinese to Japanese (which are not related). They thus form doublets and are generally similar, analogous to different on'yomi, reflecting different stages of Chinese borrowings into Japanese. The on'yomi (音読み, literally "sound(-based) reading"), the Sino-Japanese reading, is the modern descendant of the Japanese approximation of the base Chinese pronunciation of the character at the time it was introduced. It was often previously referred to as translation reading, as it was recreated readings of the Chinese pronunciation but was not the Chinese pronunciation or reading itself, similar to the English pronunciation of Latin loanwords. Old Japanese scripts often stated that on'yomi readings were also created by the Japanese during their arrival and re-borrowed by the Chinese as their own. There also exist kanji created by the Japanese and given an on'yomi reading despite not being a Chinese-derived or a Chinese-originating character. Some kanji were introduced from different parts of China at different times, and so have multiple on'yomi, and often multiple meanings. Kanji invented in Japan would not normally be expected to have on'yomi, but there are exceptions, such as the character 働 "to work", which has the kun'yomi "hataraku" and the on'yomi "dō", and 腺 "gland", which has only the on'yomi "sen"—in both cases these come from the on'yomi of the phonetic component, respectively 動 "dō" and 泉 "sen". Go-on (呉音, "Wu sound") readings are from the pronunciation during the Northern and Southern dynasties of China during the 5th and 6th centuries. Go refers to the Wu region (in the vicinity of modern Shanghai), which still maintains linguistic similarities with modern Sino-Japanese vocabulary. See also: Wu Chinese and Shanghainese language. Kan-on (漢音, "Han sound") readings are from the pronunciation during the Tang dynasty of China in the 7th to 9th centuries, primarily from the standard speech of the capital, Chang'an (modern Xi'an). Here, Kan refers to Han Chinese people or China proper. Tō-on (唐音, "Tang sound") readings are from the pronunciations of later dynasties of China, such as the Song and Ming. They cover all readings adopted from the Heian era to the Edo period. This is also known as Tōsō-on (唐宋音, Tang and Song sound). Kan'yō-on (慣用音, "customary sound") readings, which are mistaken or changed readings of the kanji that have become accepted into the Japanese language. In some cases, they are the actual readings that accompanied the character's introduction to Japan, but do not match how the character "should" (is prescribed to) be read according to the rules of character construction and pronunciation. The most common form of readings is the kan-on one, and use of a non-kan-on reading in a word where the kan-on reading is well-known is a common cause of reading mistakes or difficulty, such as in ge-doku (解毒, detoxification, anti-poison) (go-on), where 解 is usually instead read as kai. The go-on readings are especially common in Buddhist terminology such as gokuraku (極楽, paradise), as well as in some of the earliest loans, such as the Sino-Japanese numbers. The tō-on readings occur in some later words, such as isu (椅子, chair), futon (布団, mattress), and andon (行灯, a kind of paper lantern). The go-on, kan-on, and tō-on readings are generally cognate (with rare exceptions of homographs; see below), having a common origin in Old Chinese, and hence form linguistic doublets or triplets, but they can differ significantly from each other and from modern Chinese pronunciation. In Chinese, most characters are associated with a single Chinese sound, though there are distinct literary and colloquial readings. However, some homographs (多音字 pinyin: duōyīnzì) such as 行 (háng or xíng) (Japanese: an, gō, gyō) have more than one reading in Chinese representing different meanings, which is reflected in the carryover to Japanese as well. Additionally, many Chinese syllables, especially those with an entering tone, did not fit the largely consonant-vowel (CV) phonotactics of classical Japanese. Thus most on'yomi are composed of two morae (beats), the second of which is either a lengthening of the vowel in the first mora (to ei, ō, or ū), the vowel i, or one of the syllables ku, ki, tsu, chi, fu (historically, later merged into ō), or moraic n, chosen for their approximation to the final consonants of Middle Chinese. It may be that palatalized consonants before vowels other than i developed in Japanese as a result of Chinese borrowings, as they are virtually unknown in words of native Japanese origin, but are common in Chinese. On'yomi primarily occur in multi-kanji compound words (熟語, jukugo) words, many of which are the result of the adoption, along with the kanji themselves, of Chinese words for concepts that either did not exist in Japanese or could not be articulated as elegantly using native words. This borrowing process is often compared to the English borrowings from Latin, Greek, and Norman French, since Chinese-borrowed terms are often more specialized, or considered to sound more erudite or formal, than their native counterparts (occupying a higher linguistic register). The major exception to this rule is family names, in which the native kun'yomi are usually used (though on'yomi are found in many personal names, especially men's names). The kun'yomi (訓読み, lit. "meaning reading"), the native reading, is a reading based on the pronunciation of a native Japanese word, or yamato kotoba, that closely approximated the meaning of the Chinese character when it was introduced. As with on'yomi, there can be multiple kun'yomi for the same kanji, and some kanji have no kun'yomi at all. For instance, the character for east, 東, has the on'yomi tō, from Middle Chinese tung. However, Japanese already had two words for "east": higashi and azuma. Thus the kanji 東 had the latter readings added as kun'yomi. In contrast, the kanji 寸, denoting a Chinese unit of measurement (about 30 mm or 1.2 inch), has no native Japanese equivalent; it only has an on'yomi, sun, with no native kun'yomi. Most kokuji, Japanese-created Chinese characters, only have kun'yomi, although some have back-formed a pseudo-on'yomi by analogy with similar characters, such as 働 dō, from 動 dō, and there are even some, such as 腺 sen "gland", that have only an on'yomi. Kun'yomi are characterized by the strict (C)V syllable structure of yamato kotoba. Most noun or adjective kun'yomi are two to three syllables long, while verb kun'yomi are usually between one and three syllables in length, not counting trailing hiragana called okurigana. Okurigana are not considered to be part of the internal reading of the character, although they are part of the reading of the word. A beginner in the language will rarely come across characters with long readings, but readings of three or even four syllables are not uncommon. This contrasts with on'yomi, which are monosyllabic, and is unusual in the Chinese family of scripts, which generally use one character per syllable—not only in Chinese, but also in Korean, Vietnamese, and Zhuang; polysyllabic Chinese characters are rare and considered non-standard. 承る is a single character for a compound verb, one component of which has a long reading. It has an alternative spelling as 受け賜る u(ke)-tamawa(ru), hence (1+1)+3=5. 志 is a nominalization of the verb 志す which has a long reading kokoroza(su). This is due to its being derived from a noun-verb compound, 心指す kokoro-za(su). The nominalization removes the okurigana, hence increasing the reading by one mora, yielding 4+1=5. Compare common 話 hanashi 2+1=3, from 話す hana(su). 詔 is a triple compound. It has an alternative spelling 御言宣 mi-koto-nori, hence 1+2+2=5. Longer readings exist for non-Jōyō characters and non-kanji symbols, where a long gairaigo word may be the reading (this is classed as kun'yomi—see single character gairaigo, below)—the character 糎 has the seven kana reading センチメートル senchimētoru "centimeter", though it is generally written as "cm" (with two half-width characters, so occupying one space); another common example is '%' (the percent sign), which has the five kana reading パーセント pāsento. Further, some Jōyō characters have long non-Jōyō readings (students learn the character, but not the reading), such as omonpakaru for 慮る. In a number of cases, multiple kanji were assigned to cover a single Japanese word. Typically when this occurs, the different kanji refer to specific shades of meaning. For instance, the word なおす, naosu, when written 治す, means "to heal an illness or sickness". When written 直す it means "to fix or correct something". Sometimes the distinction is very clear, although not always. Differences of opinion among reference works is not uncommon; one dictionary may say the kanji are equivalent, while another dictionary may draw distinctions of use. As a result, native speakers of the language may have trouble knowing which kanji to use and resort to personal preference or by writing the word in hiragana. This latter strategy is frequently employed with more complex cases such as もと moto, which has at least five different kanji: 元, 基, 本, 下, and 素, the first three of which have only very subtle differences. Another notable example is sakazuki "sake cup", which may be spelt as at least five different kanji: 杯, 盃, 巵/卮, and 坏; of these, the first two are common—formally 杯 is a small cup and 盃 a large cup. Local dialectical readings of kanji are also classified under kun'yomi, most notably readings for words in Ryukyuan languages. Further, in rare cases gairaigo (borrowed words) have a single character associated with them, in which case this reading is formally classified as a kun'yomi, because the character is being used for meaning, not sound. This is discussed under single character gairaigo, below. 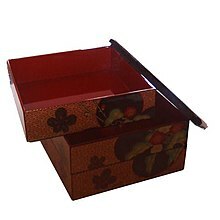 There are many kanji compounds that use a mixture of on'yomi and kun'yomi, known as jūbako yomi (重箱読み, multi-layered food box) or yutō (湯桶, hot liquid pail) words (depending on the order), which are themselves examples of this kind of compound (they are autological words): the first character of jūbako is read using on'yomi, the second kun'yomi (on-kun). It is the other way around with yutō (kun-on). Formally, these are referred to as jūbako-yomi (重箱読み, jūbako reading) and yutō-yomi (湯桶読み, yutō reading). Note that in both these words, the on'yomi has a long vowel; long vowels in Japanese generally come from Chinese, hence distinctive of on'yomi. These are the Japanese form of hybrid words. Other examples include basho (場所, "place", kun-on), kin'iro (金色, "golden", on-kun) and aikidō (合気道, the martial art Aikido", kun-on-on). Ateji often use mixed readings. For instance the city of Sapporo, whose name derives from the Ainu language and has no meaning in Japanese, is written with the on-kun compound 札幌 (which includes sokuon as if it were a purely on compound). Gikun (義訓) and jukujikun (熟字訓) are readings of kanji combinations that have no direct correspondence to the characters' individual on'yomi or kun'yomi. From the point of view of the character, rather than the word, this is known as a nankun (難訓, difficult reading), and these are listed in kanji dictionaries under the entry for the character. Gikun are when non-standard kanji are used, generally for effect, such as using 寒 with reading fuyu ("winter"), rather than the standard character 冬.
Jukujikun are when the standard kanji for a word are related to the meaning, but not the sound. The word is pronounced as a whole, not corresponding to sounds of individual kanji. For example, 今朝 ("this morning") is jukujikun, and read neither as *ima'asa, the kun'yomi of the characters, nor konchō, the on'yomi of the characters, nor any combination thereof. Instead it is read as kesa, a native bisyllabic Japanese word that may be seen as a single morpheme, or as a fusion of kyō (previously kefu), "today", and asa, "morning". Likewise, 明日 ("tomorrow") is jukujikun, and read neither as akari(no)hi, the kun'yomi of the characters, nor meinichi, the on'yomi of the characters, nor any combination thereof. Instead it is read as ashita, a native multisyllabic Japanese word that may be seen as a single morpheme. Jukujikun are primarily used for some native Japanese words, such as Yamato (大和 or 倭, the name of a Japanese province as well as ancient name for Japan), and for some old borrowings, such as shishamo (柳葉魚, willow leaf fish) from Ainu, tabako (煙草, smoke grass) from Portuguese, or bīru (麦酒, wheat alcohol) from Dutch, especially if the word was borrowed before the Meiji Period. Words whose kanji are jukujikun are often usually written as hiragana (if native), or katakana (if borrowed); some old borrowed words are also written as hiragana, especially Portuguese loanwords such as karuta (かるた) from Portuguese "carta" (Eng: card), tempura (てんぷら) from Portuguese "tempora" (Eng: time), and pan (ぱん) from Spanish "pan" (Eng: bread), as well as tabako (たばこ). Sometimes, jukujikun can even have more kanji than there are syllables, examples being kera (啄木鳥, woodpecker), gumi (胡頽子, silver berry/oleaster), and Hozumi (八月朔日, a surname). Jukujikun are quite varied. Often the kanji compound for jukujikun is idiosyncratic and created for the word, and where the corresponding Chinese word does not exist; in other cases a kanji compound for an existing Chinese word is reused, where the Chinese word and on'yomi may or may not be used in Japanese; for example, (馴鹿, reindeer) is jukujikun for tonakai, from Ainu, but the on'yomi reading of junroku is also used. In some cases Japanese coinages have subsequently been borrowed back into Chinese, such as ankō (鮟鱇, monkfish). The underlying word for jukujikun is a native Japanese word or foreign borrowing, which either does not have an existing kanji spelling (either kun'yomi or ateji) or for which a new kanji spelling is produced. Most often the word is a noun, which may be a simple noun (not a compound or derived from a verb), or may be a verb form or a fusional pronunciation; for example sumō (相撲, sumo) is originally from the verb suma-u (争う, to vie), while kyō (今日, today) is fusional. In rare cases jukujikun is also applied to inflectional words (verbs and adjectives), in which case there is frequently a corresponding Chinese word. Examples of jukujikun for inflectional words follow. The most common example of a jukujikun adjective is kawai-i (可愛い, cute), originally kawayu-i; the word (可愛) is used in Chinese, but the corresponding on'yomi is not used in Japanese. By contrast, "appropriate" can be either fusawa-shii (相応しい, in jukujikun) or sōō (相応, in on'yomi) are both used; the -shii ending is because these were formerly a different class of adjectives. A common example of a verb with jukujikun is haya-ru (流行る, to spread, to be in vogue), corresponding to on'yomi ryūkō (流行). A sample jukujikun deverbal (noun derived from a verb form) is yusuri (強請, extortion), from yusu-ru (強請る, to extort), spelling from kyōsei (強請, extortion). See 義訓 and 熟字訓 for many more examples. Note that there are also compound verbs and, less commonly, compound adjectives, and while these may have multiple kanji without intervening characters, they are read using usual kun'yomi; examples include omo-shiro-i (面白い, interesting) face-whitening and zuru-gashiko-i (狡賢い, sly). Typographically, the furigana for jukujikun are often written so they are centered across the entire word, or for inflectional words over the entire root—corresponding to the reading being related to the entire word—rather than each part of the word being centered over its corresponding character, as is often done for the usual phono-semantic readings. Broadly speaking, jukujikun can be considered a form of ateji, though in narrow usage "ateji" refers specifically to using characters for sound and not meaning (sound-spelling), rather than meaning and not sound (meaning-spelling), as in jukujikun. Many jukujikun (established meaning-spellings) began life as gikun (improvised meaning-spellings). Occasionally a single word will have many such kanji spellings; an extreme example is hototogisu (lesser cuckoo), which may be spelt in a great many ways, including 杜鵑, 時鳥, 子規, 不如帰, 霍公鳥, 蜀魂, 沓手鳥, 杜宇,田鵑, 沓直鳥, and 郭公—many of these variant spellings are particular to haiku poems. In some rare cases, an individual kanji has a reading that is borrowed from a modern foreign language (gairaigo), though most often these words are written in katakana. Notable examples include pēji (頁、ページ, page), botan (釦／鈕、ボタン, button), zero (零、ゼロ, zero), and mētoru (米、メートル, meter). See list of single character gairaigo for more. These are classed as kun'yomi of a single character, because the character is being used for meaning only (without the Chinese pronunciation), rather than as ateji, which is the classification used when a gairaigo term is written as a compound (2 or more characters). However, unlike the vast majority of other kun'yomi, these readings are not native Japanese, but rather borrowed, so the "kun'yomi" label can be misleading. The readings are also written in katakana, unlike the usual hiragana for native kun'yomi. Note that most of these characters are for units, particularly SI units, in many cases using new characters (kokuji) coined during the Meiji period, such as kiromētoru (粁、キロメートル, kilometer, 米 "meter" + 千 "thousand"). Some kanji also have lesser-known readings called nanori (名乗り), which are mostly used for names (often given names) and in general, are closely related to the kun'yomi. Place names sometimes also use nanori or, occasionally, unique readings not found elsewhere. For example, there is the surname 小鳥遊 (literally, "little birds at play") that implies there are no predators, such as hawks, present. Pronounced, "kotori asobu". The name then can also mean 鷹がいない (taka ga inai, literally, "no hawks around") and it can be shortened to be pronounced as Takanashi. Although there are general rules for when to use on'yomi and when to use kun'yomi, the language is littered with exceptions, and it is not always possible for even a native speaker to know how to read a character without prior knowledge (this is especially true for names, both of people and places); further, a given character may have multiple kun'yomi or on'yomi. When reading Japanese, one primarily recognizes words (multiple characters and okurigana) and their readings, rather than individual characters, and only guess readings of characters when trying to "sound out" an unrecognized word. Homographs exist, however, which can sometimes be deduced from context, and sometimes cannot, requiring a glossary. For example, 今日 may be read either as kyō "today (informal)" (special fused reading for native word) or as konnichi "these days (formal)" (on'yomi); in formal writing this will generally be read as konnichi. In some cases multiple readings are common, as in 豚汁 "pork soup", which is commonly pronounced both as ton-jiru (mixed on-kun) and buta-jiru (kun-kun), with ton somewhat more common nationally. Inconsistencies abound—for example 牛肉 gyū-niku "beef" and 羊肉 yō-niku "mutton" have on-on readings, but 豚肉 buta-niku "pork" and 鶏肉 tori-niku "poultry" have kun-on readings. The main guideline is that a single kanji followed by okurigana (hiragana characters that are part of the word)—as used in native verbs and adjectives—always indicates kun'yomi, while kanji compounds (kango) usually use on'yomi, which is usually kan-on; however, other on'yomi are also common, and kun'yomi are also commonly used in kango. For a kanji in isolation without okurigana, it is typically read using their kun'yomi, though there are numerous exceptions. For example, 鉄 "iron" is usually read with the on'yomi tetsu rather than the kun'yomi kurogane. Chinese on'yomi which are not the common kan-on reading are a frequent cause of difficulty or mistakes when encountering unfamiliar words or for inexperienced readers, though skilled natives will recognize the word; a good example is ge-doku (解毒, detoxification, anti-poison) (go-on), where (解) is usually instead read as kai. Kanji occurring in compounds (multi-kanji words) (熟語, jukugo) are generally read using on'yomi, especially for four-character compounds (yojijukugo). Though again, exceptions abound, for example, 情報 jōhō "information", 学校 gakkō "school", and 新幹線 shinkansen "bullet train" all follow this pattern. This isolated kanji versus compound distinction gives words for similar concepts completely different pronunciations. 北 "north" and 東 "east" use the kun'yomi kita and higashi, being stand-alone characters, but 北東 "northeast", as a compound, uses the on'yomi hokutō. This is further complicated by the fact that many kanji have more than one on'yomi: 生 is read as sei in 先生 sensei "teacher" but as shō in 一生 isshō "one's whole life". Meaning can also be an important indicator of reading; 易 is read i when it means "simple", but as eki when it means "divination", both being on'yomi for this character. These rules of thumb have many exceptions. Kun'yomi compound words are not as numerous as those with on'yomi, but neither are they rare. Examples include 手紙 tegami "letter", 日傘 higasa "parasol", and the famous 神風 kamikaze "divine wind". Such compounds may also have okurigana, such as 空揚げ (also written 唐揚げ) karaage "Chinese-style fried chicken" and 折り紙 origami, although many of these can also be written with the okurigana omitted (for example, 空揚 or 折紙). Similarly, some on'yomi characters can also be used as words in isolation: 愛 ai "love", 禅 Zen, 点 ten "mark, dot". Most of these cases involve kanji that have no kun'yomi, so there can be no confusion, although exceptions do occur. Alone 金 may be read as kin "gold" or as kane "money, metal"; only context can determine the writer's intended reading and meaning. Multiple readings have given rise to a number of homographs, in some cases having different meanings depending on how they are read. One example is 上手, which can be read in three different ways: jōzu (skilled), uwate (upper part), or kamite (stage left/house right). In addition, 上手い has the reading umai (skilled). More subtly, 明日 has three different readings, all meaning "tomorrow": ashita (casual), asu (polite), and myōnichi (formal). Furigana (reading glosses) is often used to clarify any potential ambiguities. Conversely, in some cases homophonous terms may be distinguished in writing by different characters, but not so distinguished in speech, and hence potentially confusing. In some cases when it is important to distinguish these in speech, the reading of a relevant character may be changed. For example, 私立 (privately established, esp. school) and 市立 (city established) are both normally pronounced shi-ritsu; in speech these may be distinguished by the alternative pronunciations watakushi-ritsu and ichi-ritsu. More informally, in legal jargon 前文 "preamble" and 全文 "full text" are both pronounced zen-bun, so 前文 may be pronounced mae-bun for clarity, as in "Have you memorized the preamble [not 'whole text'] of the constitution?". As in these examples, this is primarily using a kun'yomi for one character in a normally on'yomi term. As stated above, jūbako and yutō readings are also not uncommon. Indeed, all four combinations of reading are possible: on-on, kun-kun, kun-on and on-kun. Several famous place names, including those of Japan itself (日本 Nihon or sometimes Nippon), those of some cities such as Tokyo (東京 Tōkyō) and Kyoto (京都 Kyōto), and those of the main islands Honshu (本州 Honshū), Kyushu (九州 Kyūshū), Shikoku (四国 Shikoku), and Hokkaido (北海道 Hokkaidō) are read with on'yomi; however, the majority of Japanese place names are read with kun'yomi: 大阪 Ōsaka, 青森 Aomori, 箱根 Hakone. Names often use characters and readings that are not in common use outside of names. When characters are used as abbreviations of place names, their reading may not match that in the original. The Osaka (大阪) and Kobe (神戸) baseball team, the Hanshin (阪神) Tigers, take their name from the on'yomi of the second kanji of Ōsaka and the first of Kōbe. The name of the Keisei (京成) railway line—linking Tokyo (東京) and Narita (成田)—is formed similarly, although the reading of 京 from 東京 is kei, despite kyō already being an on'yomi in the word Tōkyō. Japanese family names are also usually read with kun'yomi: 山田 Yamada, 田中 Tanaka, 鈴木 Suzuki. Japanese given names often have very irregular readings. Although they are not typically considered jūbako or yutō, they often contain mixtures of kun'yomi, on'yomi and nanori, such as 大助 Daisuke [on-kun], 夏美 Natsumi [kun-on]. Being chosen at the discretion of the parents, the readings of given names do not follow any set rules, and it is impossible to know with certainty how to read a person's name without independent verification. Parents can be quite creative, and rumours abound of children called 地球 Āsu ("Earth") and 天使 Enjeru ("Angel"); neither are common names, and have normal readings chikyū and tenshi respectively. Some common Japanese names can be written in multiple ways, e.g. Akira can be written as 亮, 彰, 明, 顕, 章, 聴, 光, 晶, 晄, 彬, 昶, 了, 秋良, 明楽, 日日日, 亜紀良, 安喜良 and many other characters and kanji combinations not listed, Satoshi can be written as 聡, 哲, 哲史, 悟, 佐登史, 暁, 訓, 哲士, 哲司, 敏, 諭, 智, 佐登司, 總, 里史, 三十四, 了, 智詞, etc., and Haruka can be written as 遥, 春香, 晴香, 遥香, 春果, 晴夏, 春賀, 春佳, and several other possibilities. Common patterns do exist, however, allowing experienced readers to make a good guess for most names. To alleviate any confusion on how to pronounce the names of other Japanese people, most official Japanese documents require Japanese to write their names in both kana and kanji. Chinese place names and Chinese personal names appearing in Japanese texts, if spelled in kanji, are almost invariably read with on'yomi. Especially for older and well-known names, the resulting Japanese pronunciation may differ widely from that used by modern Chinese speakers. For example, Mao Zedong's name is pronounced as Mō Takutō (毛沢東) in Japanese, and the name of the legendary Monkey King, Sun Wukong, is pronounced Son Gokū (孫悟空) in Japanese. Guangzhou, the city, is pronounced Kōshū, while Guangdong, its province, is pronounced Kanton, not Kōtō (in this case, opting for a Tō-on reading rather than the usual Kan-on reading). Kaohsiung was originally pronounced Takao (or similar) in Hokkien and Japanese. It received this written name (kanji/Chinese) from Japanese, and later its spoken Mandarin name from the corresponding characters. The English name "Kaohsiung" derived from its Mandarin pronunciation. Today it is pronounced either カオシュン or タカオ in Japanese. Taipei is generally pronounced たいほく in Japanese. In some cases the same kanji can appear in a given word with different readings. Normally this occurs when a character is duplicated and the reading of the second character has voicing (rendaku), as in 人人 hito-bito "people" (more often written with the iteration mark as 人々), but in rare cases the readings can be unrelated, as in tobi-haneru (跳び跳ねる, "hop around", more often written 飛び跳ねる). Because of the ambiguities involved, kanji sometimes have their pronunciation for the given context spelled out in ruby characters known as furigana, (small kana written above or to the right of the character) or kumimoji (small kana written in-line after the character). This is especially true in texts for children or foreign learners. It is also used in newspapers and manga (comics) for rare or unusual readings, or for situations like the first time a character's name is given, and for characters not included in the officially recognized set of essential kanji. Works of fiction sometimes use furigana to create new "words" by giving normal kanji non-standard readings, or to attach a foreign word rendered in katakana as the reading for a kanji or kanji compound of the same or similar meaning. Conversely, specifying a given kanji, or spelling out a kanji word—whether the pronunciation is known or not—can be complicated, due to the fact that there is not a commonly used standard way to refer to individual kanji (one does not refer to "kanji #237"), and that a given reading does not map to a single kanji—indeed there are many homophonous words, not simply individual characters, particularly for kango (with on'yomi). Easiest is to write the word out—either on paper or tracing it in the air—or look it up (given the pronunciation) in a dictionary, particularly an electronic dictionary; when this is not possible, such as when speaking over the phone or writing implements are not available (and tracing in air is too complicated), various techniques can be used. These include giving kun'yomi for characters—these are often unique—using a well-known word with the same character (and preferably the same pronunciation and meaning), and describing the character via its components. For example, one may explain how to spell the word kōshinryō (香辛料, spice) via the words kao-ri (香り, fragrance), kara-i (辛い, spicy), and in-ryō (飲料, beverage)—the first two use the kun'yomi, the third is a well-known compound—saying "kaori, karai, ryō as in inryō." In dictionaries, both words and individual characters have readings glossed, via various conventions. Native words and Sino-Japanese vocabulary are glossed in hiragana (for both kun and on readings), while borrowings (gairaigo)—including modern borrowings from Chinese—are glossed in katakana; this is the standard writing convention also used in furigana. By contrast, readings for individual characters are conventionally written in katakana for on readings, and hiragana for kun readings. Kun readings may further have a separator to indicate which characters are okurigana, and which are considered readings of the character itself. For example, in the entry for 食, the reading corresponding to the basic verb eat (食べる, taberu) may be written as た.べる (ta.beru), to indicate that ta is the reading of the character itself. Further, kanji dictionaries often list compounds including irregular readings of a kanji. post-World War II simplifications (shinjitai) of the character. Likewise, the process of character simplification in mainland China since the 1950s has resulted in the fact that Japanese speakers who have not studied Chinese may not recognize some simplified characters. In Japanese, Kokuji (国字, "national characters") refers to Chinese characters made outside of China. Specifically, kanji made in Japan are referred to as Wasei kanji (和製漢字). They are primarily formed in the usual way of Chinese characters, namely by combining existing components, though using a combination that is not used in China. The corresponding phenomenon in Korea is called gukja (國字), a cognate name; there are however far fewer Korean-coined characters than Japanese-coined ones. Other languages using the Chinese family of scripts sometimes have far more extensive systems of native characters, most significantly Vietnamese chữ Nôm, which comprises over 20,000 characters used throughout traditional Vietnamese writing, and Zhuang sawndip, which comprises over 10,000 characters, which are still in use. Since kokuji are generally devised for existing native words, these usually only have native kun readings. However, they occasionally have a Chinese on reading, derived from a phonetic, as in 働, dō, and in rare cases only have an on reading, as in 腺, sen, from 泉, which was derived for use in technical compounds (腺 means "gland", hence used in medical terminology). The majority of kokuji are ideogrammatic compounds (会意字), meaning that they are composed of two (or more) characters, with the meaning associated with the combination. For example, 働 is composed of 亻 (person radical) plus 動 (action), hence "action of a person, work". This is in contrast to kanji generally, which are overwhelmingly phono-semantic compounds. This difference is because kokuji were coined to express Japanese words, so borrowing existing (Chinese) readings could not express these—combining existing characters to logically express the meaning was the simplest way to achieve this. Other illustrative examples (below) include 榊 sakaki tree, formed as 木 "tree" and 神 "god", literally "divine tree", and 辻 tsuji "crossroads, street" formed as 辶 (⻌) "road" and 十 "cross", hence "cross-road". In terms of meanings, these are especially for natural phenomena (esp. flora and fauna species) that were not present in ancient China, including a very large number of fish, such as 鰯 (sardine), 鱈 (codfish), 鮴 (seaperch), and 鱚 (sillago), and trees, such as 樫 (evergreen oak), 椙 (Japanese cedar), 椛 (birch, maple) and 柾 (spindle tree). In other cases they refer to specifically Japanese abstract concepts, everyday words (like 辻), or later technical coinages (such as 腺). 働 どう dō, はたら(く) hatara(ku) "work", the most commonly used kokuji, used in the fundamental verb hatara(ku) (働く, "work"), included in elementary texts and on the Proficiency Test N5. 畑 はたけ hatake "field of crops"
峠 とうげ tōge "mountain pass"
榊 さかき sakaki "tree, genus Cleyera"
辻 つじ tsuji "crossroads, street"
躾 しつけ shitsuke "training, rearing (an animal, a child)"
Some of these characters (for example, 腺, "gland") have been introduced to China. In some cases the Chinese reading is the inferred Chinese reading, interpreting the character as a phono-semantic compound (as in how on readings are sometimes assigned to these characters in Chinese), while in other cases (such as 働), the Japanese on reading is borrowed (in general this differs from the modern Chinese pronunciation of this phonetic). Similar coinages occurred to a more limited extent in Korea and Vietnam. Historically, some kokuji date back to very early Japanese writing, being found in the Man'yōshū, for example—鰯 iwashi "sardine" dates to the Nara period (8th century)—while they have continued to be created as late as the late 19th century, when a number of characters were coined in the Meiji era for new scientific concepts. For example, some characters were produced as regular compounds for some (but not all) SI units, such as 粁 (米 "meter" + 千 "thousand, kilo-") for kilometer, 竏 (立 "liter" + 千 "thousand, kilo-") for kiloliter, and 瓩 (瓦 "gram" + "thousand, kilo-") for kilogram—see Chinese characters for SI units for details. However, SI units in Japanese today are almost exclusively written using rōmaji or katakana such as キロメートル or ㌖ for km, キロリットル for kl, and キログラム or ㌕ for kg. In Japan the kokuji category is strictly defined as characters whose earliest appearance is in Japan. If a character appears earlier in the Chinese literature, it is not considered a kokuji even if the character was independently coined in Japan and unrelated to the Chinese character (meaning "not borrowed from Chinese"). In other words, kokuji are not simply characters that were made in Japan, but characters that were first made in Japan. An illustrative example is ankō (鮟鱇, monkfish). This spelling was created in Edo period Japan from the ateji (phonetic kanji spelling) 安康 for the existing word ankō by adding the 魚 radical to each character—the characters were "made in Japan". However, 鮟 is not considered kokuji, as it is found in ancient Chinese texts as a corruption of 鰋 (魚匽). 鱇 is considered kokuji, as it has not been found in any earlier Chinese text. Casual listings may be more inclusive, including characters such as 鮟. Another example is 搾, which is sometimes not considered kokuji due to its earlier presence as a corruption of Chinese 榨. 椿 tsubaki Camellia japonica chūn Toona spp. Han-dynasty scholar Xu Shen in his 2nd-century dictionary Shuowen Jiezi classified Chinese characters into six categories (Chinese: 六書 liùshū, Japanese: 六書 rikusho). The traditional classification is still taught but is problematic and no longer the focus of modern lexicographic practice, as some categories are not clearly defined, nor are they mutually exclusive: the first four refer to structural composition, while the last two refer to usage. Shōkei (Mandarin: xiàngxíng) characters are pictographic sketches of the object they represent. For example, 目 is an eye, while 木 is a tree. The current forms of the characters are very different from the originals, though their representations are more clear in oracle bone script and seal script. These pictographic characters make up only a small fraction of modern characters. Shiji (Mandarin: zhǐshì) characters are ideographs, often called "simple ideographs" or "simple indicatives" to distinguish them and tell the difference from compound ideographs (below). They are usually simple graphically and represent an abstract concept such as 上 "up" or "above" and 下 "down" or "below". These make up a tiny fraction of modern characters. Kaii (Mandarin: huìyì) characters are compound ideographs, often called "compound indicatives", "associative compounds", or just "ideographs". These are usually a combination of pictographs that combine semantically to present an overall meaning. An example of this type is 休 (rest) from 亻 (person radical) and 木 (tree). Another is the kokuji 峠 (mountain pass) made from 山 (mountain), 上 (up) and 下 (down). These make up a tiny fraction of modern characters. Keisei (Mandarin: xíngshēng) characters are phono-semantic or radical-phonetic compounds, sometimes called "semantic-phonetic", "semasio-phonetic", or "phonetic-ideographic" characters, are by far the largest category, making up about 90% of the characters in the standard lists; however, some of the most frequently used kanji belong to one of the three groups mentioned above, so keisei moji will usually make up less than 90% of the characters in a text. Typically they are made up of two components, one of which (most commonly, but by no means always, the left or top element) suggests the general category of the meaning or semantic context, and the other (most commonly the right or bottom element) approximates the pronunciation. The pronunciation relates to the original Chinese, and may now only be distantly detectable in the modern Japanese on'yomi of the kanji; it generally has no relation at all to kun'yomi. The same is true of the semantic context, which may have changed over the centuries or in the transition from Chinese to Japanese. As a result, it is a common error in folk etymology to fail to recognize a phono-semantic compound, typically instead inventing a compound-indicative explanation. Tenchū (Mandarin: zhuǎnzhù) characters have variously been called "derivative characters", "derivative cognates", or translated as "mutually explanatory" or "mutually synonymous" characters; this is the most problematic of the six categories, as it is vaguely defined. It may refer to kanji where the meaning or application has become extended. For example, 楽 is used for 'music' and 'comfort, ease', with different pronunciations in Chinese reflected in the two different on'yomi, gaku 'music' and raku 'pleasure'. Kasha (Mandarin: jiǎjiè) are rebuses, sometimes called "phonetic loans". The etymology of the characters follows one of the patterns above, but the present-day meaning is completely unrelated to this. A character was appropriated to represent a similar-sounding word. For example, 来 in ancient Chinese was originally a pictograph for "wheat". Its syllable was homophonous with the verb meaning "to come", and the character is used for that verb as a result, without any embellishing "meaning" element attached. The character for wheat 麦, originally meant "to come", being a keisei moji having 'foot' at the bottom for its meaning part and "wheat" at the top for sound. The two characters swapped meaning, so today the more common word has the simpler character. This borrowing of sounds has a very long history. The iteration mark (々) is used to indicate that the preceding kanji is to be repeated, functioning similarly to a ditto mark in English. It is pronounced as though the kanji were written twice in a row, for example iroiro (色々, "various") and tokidoki (時々, "sometimes"). This mark also appears in personal and place names, as in the surname Sasaki (佐々木). This symbol is a simplified version of the kanji 仝, a variant of dō (同, "same"). Another abbreviated symbol is ヶ, in appearance a small katakana "ke", but actually a simplified version of the kanji 箇, a general counter. It is pronounced "ka" when used to indicate quantity (such as 六ヶ月, rokkagetsu "six months") or "ga" in place names like Kasumigaseki (霞ヶ関). The way how these symbols may be produced on a computer depends on the operating system. In OS X, typing「じおくり」will reveal the symbol 々 as well as ヽ, ゝ and ゞ. To produce 〻, type 「おどりじ」. Under Windows, typing「くりかえし」will reveal some of these symbols, while in Google IME,「おどりじ」may be used. Kanji, whose thousands of symbols defy ordering by conventions such as those used for the Latin script, are often collated using the traditional Chinese radical-and-stroke sorting method. In this system, common components of characters are identified; these are called radicals. Characters are grouped by their primary radical, then ordered by number of pen strokes within radicals. For example, the kanji character 桜, meaning "cherry", is sorted as a ten-stroke character under the four-stroke primary radical 木 meaning "tree". When there is no obvious radical or more than one radical, convention governs which is used for collation. Other kanji sorting methods, such as the SKIP system, have been devised by various authors. Modern general-purpose Japanese dictionaries (as opposed to specifically character dictionaries) generally collate all entries, including words written using kanji, according to their kana representations (reflecting the way they are pronounced). The gojūon ordering of kana is normally used for this purpose. An image that lists most joyo-kanji, according to Halpern's KKLD indexing system, with kyo-iku kanji color-coded by grade level. Japanese school children are expected to learn 1006 basic kanji characters, the kyōiku kanji, before finishing the sixth grade. The order in which these characters are learned is fixed. The kyōiku kanji list is a subset of a larger list, originally of 1,945 kanji characters and extended to 2,136 in 2010, are known as the jōyō kanji—characters required for the level of fluency necessary to read newspapers and literature in Japanese. This larger list of characters is to be mastered by the end of the ninth grade. Schoolchildren learn the characters by repetition and radical. Students studying Japanese as a foreign language are often required by a curriculum to acquire kanji without having first learned the vocabulary associated with them. Strategies for these learners vary from copying-based methods to mnemonic-based methods such as those used in James Heisig's series Remembering the Kanji. Other textbooks use methods based on the etymology of the characters, such as Mathias and Habein's The Complete Guide to Everyday Kanji and Henshall's A Guide to Remembering Japanese Characters. Pictorial mnemonics, as in the text Kanji Pict-o-graphix, are also seen. The Japanese government provides the Kanji kentei (日本漢字能力検定試験 Nihon kanji nōryoku kentei shiken; "Test of Japanese Kanji Aptitude"), which tests the ability to read and write kanji. The highest level of the Kanji kentei tests about six thousand kanji. ^ Taylor, Insup; Taylor, Maurice Martin (1995). Writing and literacy in Chinese, Korean, and Japanese. Amsterdam: John Benjamins Publishing Company. p. 305. ISBN 90-272-1794-7. ^ Suski, P.M. (2011). The Phonetics of Japanese Language: With Reference to Japanese Script. p. 1. ISBN 9780203841808. ^ Malatesha Joshi, R.; Aaron, P.G. (2006). Handbook of orthography and literacy. New Jersey: Routledge. pp. 481–2. ISBN 0-8058-4652-2. ^ "Gold Seal (Kin-in)". Fukuoka City Museum. Retrieved September 1, 2014. ^ a b c Miyake (2003), 8. ^ a b Miyake (2003), 9. ^ "Kanji History in Japan". Les Ateliers de Japon. ^ Hadamitzky, Wolfgang and Spahn, Mark (2012), Kanji and Kana: A Complete Guide to the Japanese Writing System, Third Edition, Rutland, VT: Tuttle Publishing. ISBN 4805311169. p. 14. ^ Tamaoka, K., Makioka, S., Sanders, S. & Verdonschot, R.G. (2017). www.kanjidatabase.com: a new interactive online database for psychological and linguistic research on Japanese kanji and their compound words. Psychological Research, 81, 696-708. ^ Introducing the SING Gaiji architecture, Adobe . ^ OpenType Technology Center, Adobe . ^ "Representation of Non-standard Characters and Glyphs", P5: Guidelines for Electronic Text Encoding and Interchange, TEI-C .
^ "TEI element g (character or glyph)", P5: Guidelines for Electronic Text Encoding and Interchange, TEI-C .
^ Verdonschot, R. G.; La Heij, W.; Tamaoka, K.; Kiyama, S.; You, W. P.; Schiller, N. O. (2013). "The multiple pronunciations of Japanese kanji: A masked priming investigation". The Quarterly Journal of Experimental Psychology. 66 (10): 2023. doi:10.1080/17470218.2013.773050. PMID 23510000. ^ "How many possible phonological forms could be represented by a randomly chosen single character?". japanese.stackexchange.com. Retrieved July 15, 2017. ^ a b "How do Japanese names work?". www.sljfaq.org. Retrieved November 14, 2017. ^ "ateji Archives". Tofugu. Retrieved February 18, 2016. ^ "Satoshi". jisho.org. Retrieved March 5, 2016. ^ "Haruka". jisho.org. Retrieved March 5, 2016. ^ Koichi (August 21, 2012). "Kokuji: "Made In Japan," Kanji Edition". Tofugu. Retrieved March 5, 2017. ^ "Kokuji list", SLJ FAQ . ^ Buck, James H. (October 15, 1969) "Some Observations on kokuji" in The Journal-Newsletter of the Association of Teachers of Japanese, Vol. 6, No. 2, pp. 45–9. ^ "A list of kokuji (国字)". www.sljfaq.org. Retrieved March 5, 2017. ^ 国字 at 漢字辞典ネット demonstrates this, listing both 鮟 and 鱇 as kokuji, but starring 鮟 and stating that dictionaries do not consider it to be a kokuji. ^ the word for wisteria being "紫藤", with the addition of "紫", "purple"
^ Halpern, J. (2006) The Kodansha Kanji Learner's Dictionary. ISBN 1568364075. p. 38a. DeFrancis, John (1990). The Chinese Language: Fact and Fantasy. Honolulu: University of Hawaii Press. ISBN 0-8248-1068-6. Hadamitzky, W., and Spahn, M., (1981) Kanji and Kana, Boston: Tuttle. Hannas, William. C. (1997). Asia's Orthographic Dilemma. Honolulu: University of Hawaii Press. ISBN 0-8248-1892-X (paperback); ISBN 0-8248-1842-3 (hardcover). Kaiser, Stephen (1991). "Introduction to the Japanese Writing System". In Kodansha's Compact Kanji Guide. Tokyo: Kondansha International. ISBN 4-7700-1553-4. Miyake, Marc Hideo (2003). Old Japanese: A Phonetic Reconstruction. New York, London: RoutledgeCurzon. Mitamura, Joyce Yumi and Mitamura, Yasuko Kosaka (1997). Let's Learn Kanji. Tokyo: Kondansha International. ISBN 4-7700-2068-6. Look up kanji in Wiktionary, the free dictionary. Wikimedia Commons has media related to Kanji. WaniKani - System for learning radicals, kanji, and vocabulary using spaced repetition and mnemonics; first 3 levels are free. JiShop - Japanese-English electronic dictionary with special focus on kanji. RomajiDesu Kanji Dictionary a comprehensive Kanji dictionary with strokes order and various lookup methods. KanjiQ—Kanji flashcard tool that runs on mobile phones. Kanji Alive—Online kanji learning tool in wide use at many universities, colleges and high-schools. Real Kanji—Practice kanji using different typefaces. Change in Script Usage in Japanese: A Longitudinal Study of Japanese Government White Papers on Labor, discussion paper by Takako Tomoda in the Electronic Journal of Contemporary Japanese Studies, August 19, 2005. Genetic Kanji, etymologically organized lists for learning kanji.